In the 1920s, a group of disgruntled Pullman porters in New York City asked an African-American labor militant, A. Philip Randolph, left, a strong advocate of the rights of black working men and women, to form an independent union of sleeping car porters and maids. 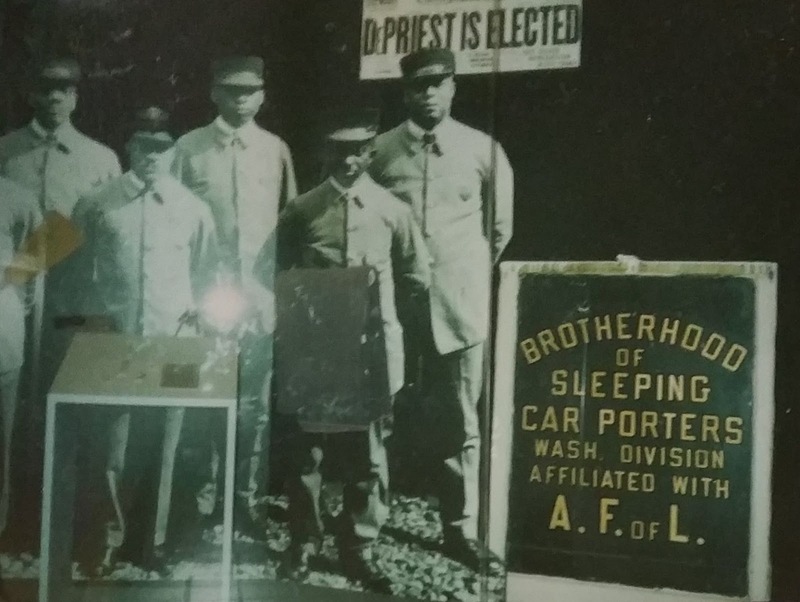 Officially founded in 1925, the International Brotherhood of Sleeping Car Porters (IBSCP) was the first successful black trade union in the United States. 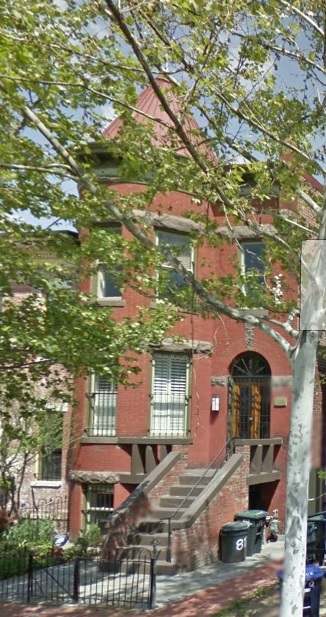 Its local chapter office was operated out of 817 Q Street, NW, (left) from 1943 to 1978. 1. The porters worked for the Pullman Company, whose founder, George Pullman, invented the overnight sleeping train car in the 1880s in Chicago. 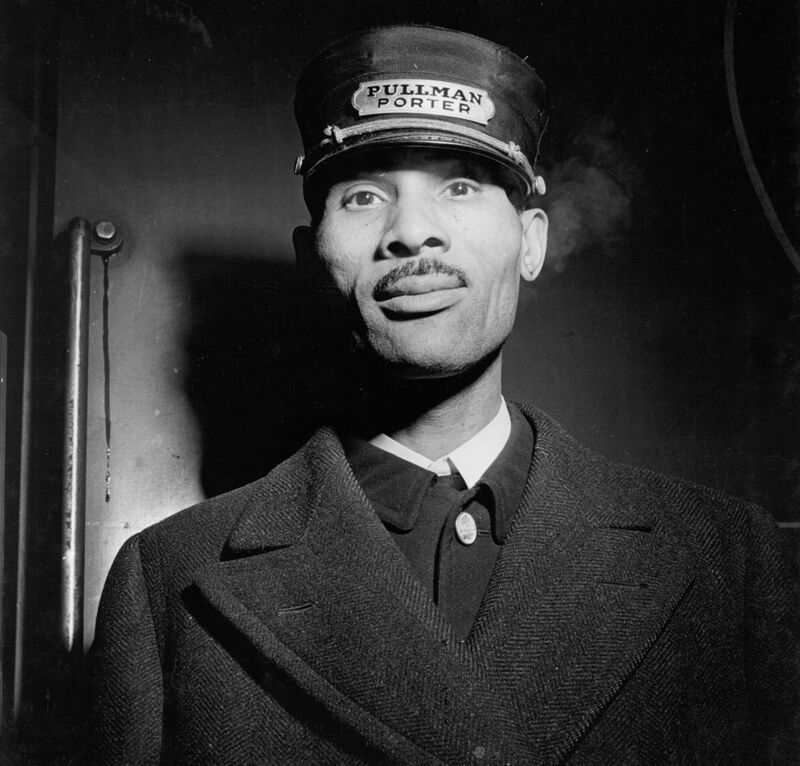 Pullman hired black men and women to serve as porters, attendants, and maids to the mostly white passengers who used the first class train accommodations. By using blacks in a service capacity, he was drawing upon the master-servant relationship of slavery days when blacks were servants to white masters. Born in Crescent City, Florida, the son of a Methodist minister, Randolph (left) moved to Harlem in New York City in 1911 to become an actor. He attended City College at night, and in 1912 founded an employment agency with Chandler Owen that tried to organize black workers. After the United States declared war on Germany in 1917, the two men started a magazine, THE MESSENGER, that called for more jobs in the war industry and the armed forces for blacks. After the war, Randolph lectured at New York's Rand School of Social Science and ran unsuccessfully for office on the Socialist Party ticket. The BSCP porters, facing fierce opposition not only from the Pullman Company, but also from middle-class blacks in Chicago, who did not want to antagonize the company. Randolph and the BSCP struggled with the black community as well as the Pullman Company for 12 years. He also struggled for recognition by the American Federation of Labor, the largest trade union organization in America, as the A.F.L. was hostile to black workers in the trade union movement. A. Philip Randolph was a trade unionist and one of the major civil rights leaders in America. Held in the Smithsonian collection today is the sign for the BSCP that once hung for decades in the window of 817 Q Street, seen at right. Many blacks considered labor unions "trouble-makers" that worked against the best interests of black workers. 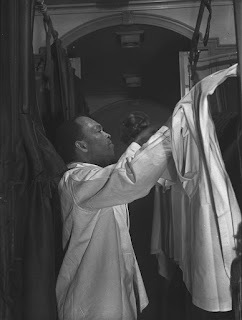 Randolph made a conscientious effort to win the support of the middle-class black community because of its great influence in the black press and with public opinion. The company refused to negotiate with the union; some charged this was because the union was black. The Brotherhood was the verge of collapsing when Congress passed federal laws guaranteeing the right of all legitimate unions to organize workers without interference from their employers, giving the union a new life. The BSCP now found itself with some legal muscle. In addition, the major labor organization in the United States, the American Federation of Labor (AFL), which had traditionally excluded blacks from its membership-now gave the Brotherhood support. 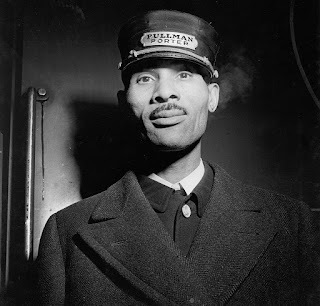 As a result, in 1937, the Pullman Company finally signed a labor agreement with the Brotherhood. A. Philip Randolph, along with Bayard Rustin, was a central figure in the 1963 March on Washington for Jobs and Freedom, much of which was planned at 817 Q Street. The photo above is attributed to the New York Times, published on April 20, 1968, two days after the riots erupted in Washington, DC and other cities following the assassination of Dr. Martin Luther King, Jr. The house at 817 Q Street can be seen at the top center, with the turret. 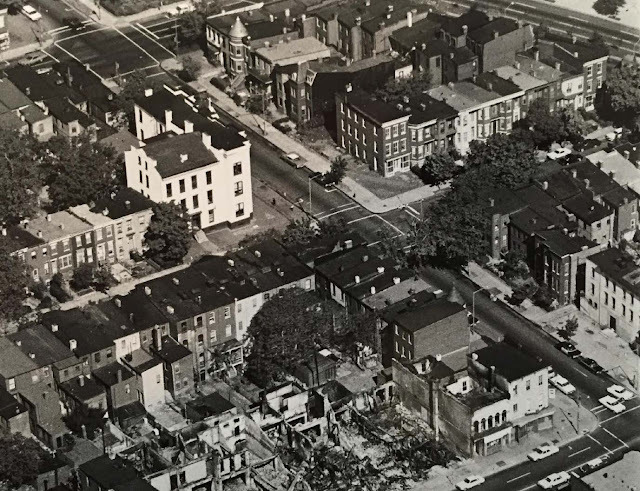 Several members of the BSCP came and went on and off the deed over the course of the next decade, until the house was eventually owned by Oscar W. and Thomasina Shelton, who had purchased it from William Anderson on February 25, 1955. They continued to rent it to the BSCP until 1978. In 1938, the female relatives of union members formed the International Ladies’ Auxiliary. Excerpted from PBS Special on BSCP by Richard Wormser. One of the largest, if not the largest, private homes in Washington is nestled behind a dense row of trees between north Cleveland Park and Forest Hills, at the intersection of Broad Branch Road and Albemarle Street. Known as Firenze House since 1941, it was constructed between 1925 and 1927 for Mrs. Blanche Estebrook O’Brien with a total of fifty-nine rooms. 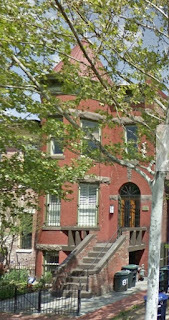 Its address today is 2800 Albemarle Street. Like many homes of the era, the Tudor styled residence featured rather dark interior rooms, furnished with Jacobean style furniture. O’Brien purchased fine paneling and mantels designed by noted architect Sir Christopher Wren in London, and had them incorporated into the house during its construction. The house itself, set among 22 acres, was constructed of gray fieldstone, quarried on the site, and limestone trim. A variegated slate roof, green shutters, and leaded glass windows completed the design. 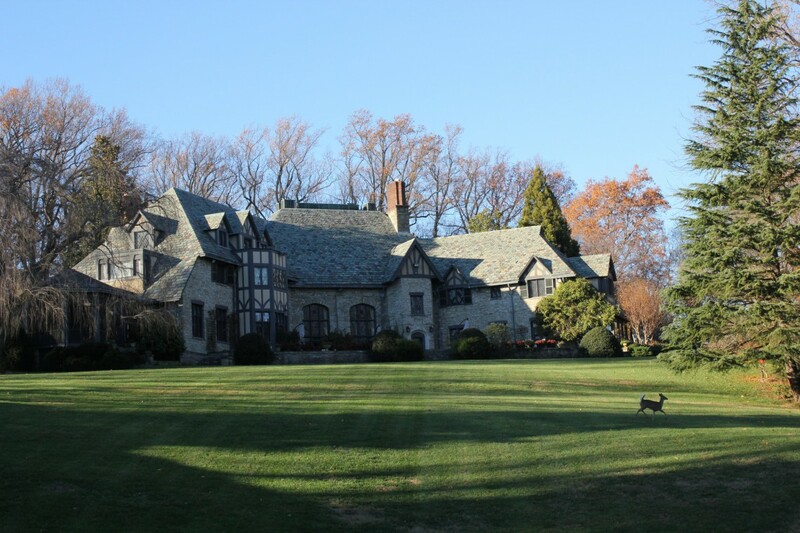 Several outbuildings also graced the estate, including a large gatehouse on Broad Branch Road, garage with servant’s quarters, ninety foot swimming pool, tennis courts, and an art studio. It was estimated that over ten thousand trees originally existed on the grounds. The home’s interiors reflected a variety of styles, dominated by an enormous three story grand hall with carved oak beams and stairway. Following the Great Depression, the property was leased to the Minister of Hungary until it was sold in 1941. The buyers that year were Colonel and Mrs. Meyer Robert Guggenheim, who had been residing on their yacht ‘Firenze’ before it was lent to the government for wartime use. The renamed their new estate ‘Firenze’ in its honor, a name that has remained to this day. The Guggenheim fortune stemmed from the M. Guggenheim and Son Mining and Smelting Company in 1925, and later from the Guggenheim Exploration Company. He retired from business in 1929. The Guggenheim’s changed much of the dark interiors into a lighter shade, by pickling the oak staircase, for example. They installed two Waterford chandeliers in the drawing room, and filled the house with priceless art, including Jacomo Victor’s “Barnyard Scene,” dated 1672, Van Dyck’s “Earl of Arundel,” and Murillo’s “Salvatori Mundi.” They also furnished the mansion with period American and European furniture of the utmost quality, mostly in Queen Anne and Hepplewhite styles. They entertained up to 600 guests at a time! Unfortunately, a fire in 1946, destroyed two Titian portraits, and a large amount of original paneling. 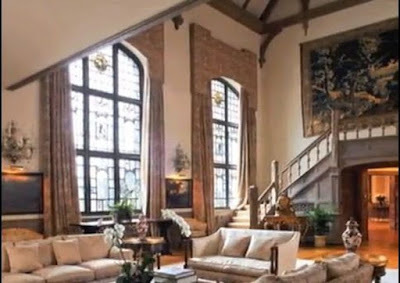 Interior decorator Michael Rosenaur was hired that year to restore the interiors of the house. M. Robert Guggenheim died in 1959, and his widow later married John A. Logan, and together they resided at the estate until the mid 1970s. Since 1976, Firenze House has been owned by the Government of Italy and used as their Ambassadors residence. Its rumored to be valued at nearly $50 million.